Dr. Suzann Harris (left) accepting the Friend of the Educator Award from Professional Educators of Tennessee State Board President, Cathy Kolb (left). Dr. Suzann Harris, dean of the School of Education, received the “Friend of the Educator” award at the annual Leader U conference. The award, which was given by the Professional Educators of Tennessee, a member-owned teachers association dedicated to quality education and the rights of teaching professionals in the state, recognizes individuals who have made an impact on and displayed outstanding involvement in the field of education. 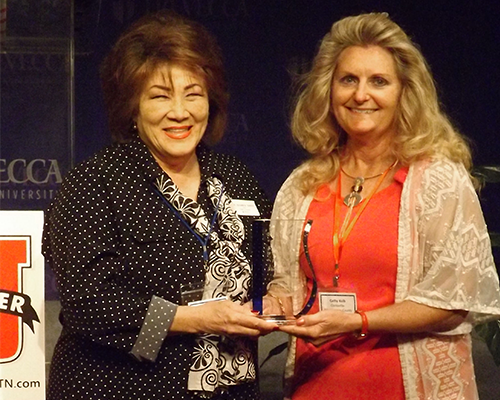 Dr. Connie Smith, an adjunct professor in Trevecca’s School of Education, was also a recipient of the same award. Dr. Harris says this makes the award even more special for the department’s development. “For both recipients to be connected to Trevecca's School of Education was not only exciting, but also further solidified the great work happening in Trevecca's SOE,” she said. Dr. Harris has been an associate professor at Trevecca since 2006 and has served as the dean of the School of Education since 2012. But before she made her place in higher education, Dr. Harris had been a teacher at a K-12 classroom. Dr. Stephen Pusey, University provost, says service majors at Trevecca, such as the education program, focus on the person as much as they do academics. And with Dr. Harris in the faculty, the program has continually maintained its quality. The “Friend of the Educator” award isn’t the first recognition Dr. Harris has received. Dr. Harris’ Trevecca career brought her the Faculty Member of the Year, Teaching Excellence award. Before that, Dr. Harris was a professor at Welch College for 12 years where she won Advisor of the Year multiple times. Though Dr. Harris has been an educator for 25 years, she says students must understand that this career has its challenges.